Integration of advanced technology in interactive kiosk, has resulted in performing wide range of functions including catalog information, cash deposit, money transfer, ticket booking, and others. The solution is widely accepted in countries including the U.S., Europe, Singapore and others. Meanwhile, in India, the solution has gained acceptance in last few years only. According to 6Wresearch, India Interactive Kiosk Market Size is projected to grow at a CAGR over 17% during 2018-24. The BFSI vertical bagged highest revenue share in 2017. In addition, the vertical is likely to continue its dominance over the coming years owing to preference of Indian consumers to visit bank kiosk solutions instead of bank branch. Major players in India Interactive Kiosk Market Share are Diebold, Forbes, NCR and 3M. Interactive kiosk market in India is witnessing higher consumer adoption on account of easier solution and less time consumption. In 2017, the market was led by the Southern region on account of higher consumer acceptance for interactive kiosk solutions. Some of the key states in the Southern region are Karnataka, Tamil Nadu and Andhra Pradesh. Over the coming years, the region is projected to drive the overall India interactive kiosk market revenues. However, the Northern region is anticipated to record the highest CAGR during the forecast period on account of rising demand from retail and BFSI verticals in the region. 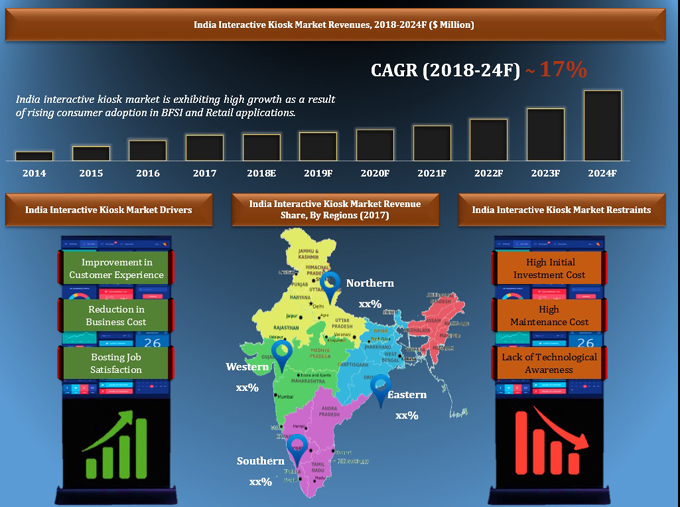 The India Interactive Kiosk Market Report thoroughly covers India interactive kiosk market by applications, verticals, components, and regions. The India Interactive Kiosk Market Outlook report provides an unbiased and detailed analysis of the India Interactive Kiosk Market Trends, opportunities, high growth areas and market drivers which would help the stakeholders to decide and align their market strategies according to the current and future market dynamics. 11.2	Safal Infosoft Pvt. Ltd.
11.7	NCR Corporation India Pvt. Ltd.